Prepare a grill for medium direct heat. While grill is heating up, Melt your butter over low heat. Add the garlic and herbs and let reduce down. Grilling: If your grill grate skew to being far apart, you will need to put your mussels on a grill/veggies pan. 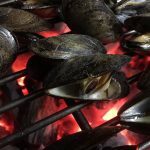 If they are within a small enough apart, you can grill the mussels directly on the grates. Grill the mussels until the pop open. This will be around 5 minutes or so… The ones that open move to a less hot part of the grill while waiting on the others. Any mussels that don’t open should be thrown away. Place the mussels in a big bowl and add sea salt and pepper. Pour the butter over the mussels. 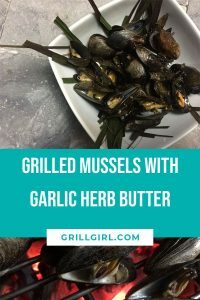 These are also really great with grilled bread- grill bread pieces until char marks form while also grilling the mussels. Dip them in the drawn butter! YESSSSS! How do you like your mussels? What do you serve them with? I would pair these with a nice glass of wine of course!